My Daily Art Display today was Joaquín Sorolla’s painting Sad Inheritance which he completed in 1899. This was a very large oil on canvas painting measuring 284cms wide and 208cms high. The painting was in tune with Sorolla’s desire of capturing the immediacy of everyday life, warts and all. This is often termed Social Realism. Social Realist artists try to illustrate people and their lives in a realistic way and because of this it is often the case that people in their paintings are not continually shown as beautiful, attractive and happy. It is often the case that these Social Realism artists will focus on the elderly and the sick, the sad and the insane or those people who have to endure a disability. 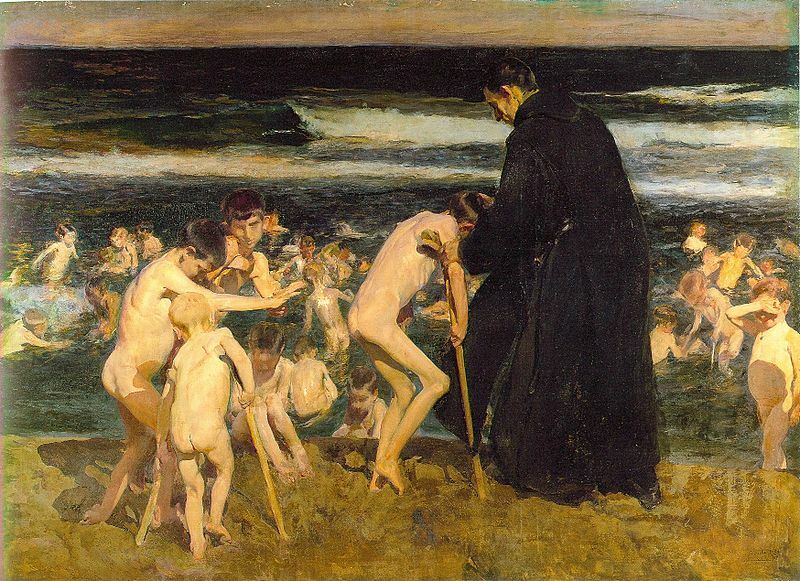 The subject matter of the painting Sad Inheritance is a party of crippled children bathing at the sea in Valencia under the watchful eye of a monk. It was in the late nineteenth century that a polio epidemic struck the Valencia area and in the painting one can see two of the boys affected by this affliction. When Sorolla exhibited this painting in the Universal Exhibition in Paris in 1900 he was awarded the Grand Prix and a medal of honour. A year later he received the medal of honour at the National Exhibition in Madrid. Award after award followed for Sorolla and in 1906 following a special exhibition of over five hundred of his paintings in Paris, he was appointed Officer of the Legion of Honour. From then on Sorolla was inundated with commissions. Sorolla suffered a paralysing stroke in 1920 and he died three years later in 1923 aged 60. His former home in Madrid is now a museum dedicated to his work. It is would be quite easy for me to play safe and just offer you works of art by famous painters but one of the things I like doing most with My Daily Art Display is to discover and highlight artists whom I have never heard of before. I find it very enjoyable and stimulating to research into their lives and searching out their works of art. I hope by offering you works of artists you have never heard of will also give you some pleasure and maybe make you curious to find out more about their lives and their art. Today My Daily Art Display is about the Austrian painter and printmaker Maximilian Kurzweil who was born in 1867 in Bisenz, which is now known as Bzenec in the Czech Republic. He first studied art at the Academy of Fine Arts Vienna. At the age of twenty five he travelled to Paris and attended the Académie Julian and it was here that he first exhibited his paintings. Whilst living in France he visited the Breton harbour town of Concarneau and fell in love with the area, its vivid sunrises and sunsets, its people and the busy port with its sailing ships and fishing fleet. In 1894 he returned to Vienna and the Academy and studied the art of portraiture. He began to be influenced by French art especially Impressionism and plein-air painting which showed him the way to use lighter – much brighter colours than those he used before. In 1895 he married Martha Guyot a woman from Brittany and they used to spend their summers in Brittany and their winters in Vienna. In 1896, at the age of twenty nine he became a member of the Künstlerhaus in Vienna but the following year he, along with Kustav Klimt, became founder-member of the Vienna Secession, also known as the Union of Austrian Artists, which was a group of Austrian artists who had resigned from the Association of Austrian Artists, housed in the Vienna Künstlerhaus. This movement included painters, sculptors, and architects. He was also editor of the Secessionist magazine Ver Sacrum (Sacred Spring). Kurzweil participated in their exhibitions with such paintings as Woman in a Yellow Dress which is My Daily Arts Display painting for today and which Kurzweil painted in 1899. Maximilian Kurzweil was also professor at the Frauenkunstschule, an academy in Vienna for female artists. He committed suicide in 1916, aged 49 after having shot a female student who was his lover. Although his artistic career was cut short he is held in high esteem and ranks almost as high as the two great Austrian artists Gustav Klimt and Egon Schiele. Woman in a Yellow Dress is a stunning painting of his beautiful wife Martha. Her arms are draped over the back of a chaise longue which is upholstered in a green patterned fabric, as she gazes out at us in a languid and relaxed pose. There is a supreme look of contentment in her expression. 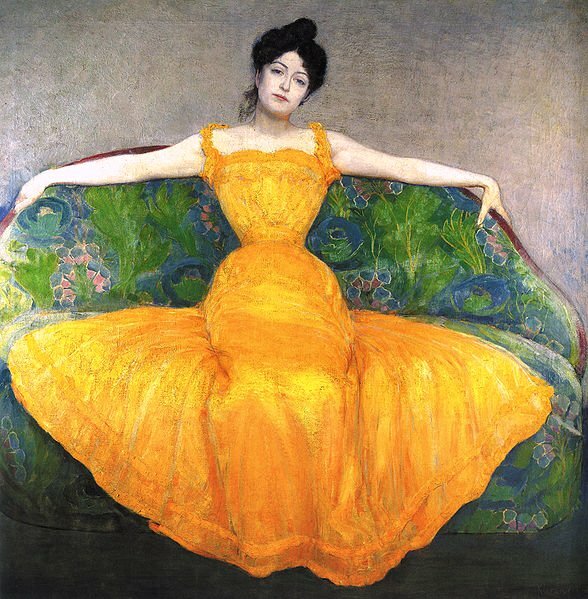 The yellow dress with its many tones is in total harmony with the sofa and compliments her pale limbs. Mary decided that a life as an artist was for her but her parents disapproved. However she was, even at this young age, very headstrong and wasn’t to be discouraged and at the age of fifteen studied art at the Pennsylvania Academy of the Fine Arts in Philadelphia. She became disillusioned with the Academy and the way budding female artists were treated and despite her father’s disapproval and his many objections, which she finally overcame, in 1866 she travelled to Paris, initially chaperoned by her mother and some family friends. Whilst in Paris she met and was taught by Camille Pissarro, the great French Impressionist painter. She was a great admirer of the works of Edgar Degas whom she met and became great friends with. He was to have considerable influence on her life and her art work. As time went on the Impressionist movement in Paris benefited greatly from Cassatt who helped them both financially and by facilitating them getting their works of art recognised and accepted in American museums and galleries. Cassatt’s family never believed that their daughter would stay long in Paris and were surprised by her determination to succeed in the French capital. Her sister Lydia, who Mary said was not just a sister but her best friend, joined her in France in 1874, so as to be company for her. Three years later her parents moved to Paris. Lydia Cassatt, as well as being very close to Mary, was also the model for many of Mary Cassatt’s most famous paintings. Sadly after long bouts of illness Lydia died in 1882. This had a devastating effect on Mary who for a time stopped painting. Mary Cassatt was an outspoken individual who was never backward in coming forward with her opinions. Some say she was too outspoken. However, being wealthy allowed her to be independent and she did not need to suffer fools. Her independent attitude and her frankness, which on occasions was considered insulting, became more noticeable as she grew older. She was highly critical of the modern artists such as Picasso and Matisse and even some of her Impressionist colleagues received her unbridled censure. Mary was a prolific and a well respected artist on both sides of the Atlantic and her works of art when they come up for sale now realise millions of dollars. Like her friend and mentor Edgar Degas she suffered with failing eyesight and when she died in 1926, aged 82 she was blind. Mary Cassatt’s place in the history of American art is unique, not only because she was one of the few woman artists of any nationality to succeed professionally in her time, but also because she was the only American artist to exhibit with the French Impressionists. 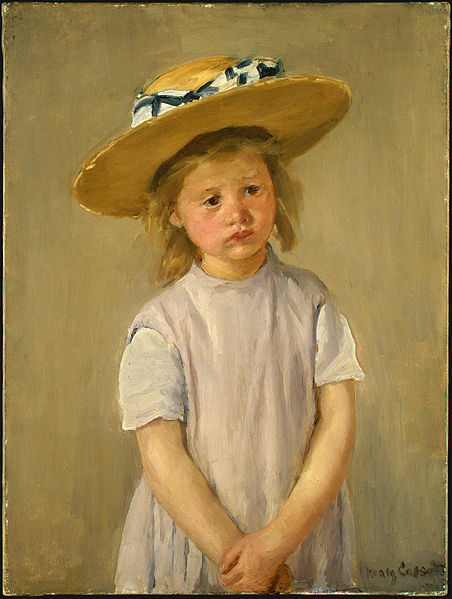 My Daily Art Display today is a painting completed in 1886 by Mary Cassatt entitled Child in a Straw Hat. Mary Cassatt’s favourite subjects became children and women with children in ordinary scenes. Her paintings express a deep tenderness and her own love for children. But she never had children of her own. Cassatt was fond of painting young girls in large elaborate hats and bonnets wearing frilly dresses. However in this painting the girl wears a simple plain gray pinafore and her hat, albeit very large, is a simple straw one. The child, with a furrowed brow, doesn’t look too pleased and has a sullen and slightly glum look on her face. There is an air of impatience in her expression and maybe this is due to having to pose for the artist when she would rather have been out playing. Some time ago I talked about Madonna and Child genre of paintings and said that I believed that, as far as religious paintings were concerned, they were the most prolific type of religious art throughout the ages. Other highly popular religious concepts in paintings are the Pietà and the Lamentation. The Lamentation represents a particular moment from Christ’s Passion, between the Deposition (the bringing down of the lifeless body of Jesus Christ from the cross after the crucifixion) and the Entombment. The paintings always show groups of grieving mourners gathered around the central figure of Christ and his mother, the Virgin Mary. They often appeared in narrative paintings of the Passion of Jesus Christ. The term Pieta derives from the Italian word for pity. The Pietà is a timeless image, and is a term applied to a painting or sculpture which usually just depicts the Virgin Mary and the dead Christ, often with the Virgin Mary supporting the body of Christ on her lap. However, sometimes the characters of St John the Evangelist or Mary Magdalene would be added to the scene. The setting does not depict a particular moment in the Passion story, unlike scenes of the Lamentation. So is My Daily Art Display today a Pietà or a Lamentation? It is entitled a pietà so who am I to disagree ! It is tempera on panel painting which I came across this week and which I thought was very heartrending and poignant. One could almost feel the grief of the Virgin Mary and St John the Evangelist. 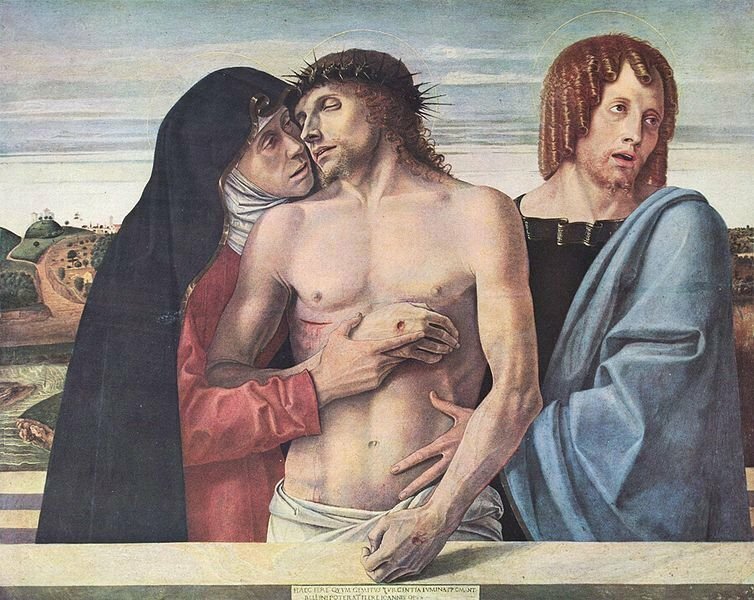 The work of art painted in 1460 and entitled Dead Christ Supported by the Madonna and St John; (Pietàa) is by Giovanni Bellini and can be seen at the Pinacoteca di Brera in Milan. To me, this perfectly sums up the painting. It is not just me that is moved by this painting as it has been rightly considered as one of the most moving paintings in the history of art. There is a deep passionate feeling to this painting. It is not just religious passion but human and psychological passion. Look at the Virgin Mary as she looks into the eyes of her dead son. See how she is almost using his shoulder to support her chin. There is a deep hurt and sorrow in her eyes as she looks intently at the face of her lifeless son. Is there anything more moving that a mother’s sorrow for the loss of her only son? She clutches the right wrist of Jesus and holds his lifeless limb across his chest. She is almost cuddling him wishing she could breathe life into his dead body. We can see the wound on the back of his right hand made by the crucifixion and Jesus’s left hand, with his fingers curled closed in pain, rests on the parapet. To the right we see Saint John the Evangelist’s with his face wracked with sorrow and one can empathise with his desolation. His head is turned away from Mary and Jesus as if he can no longer bear to look at the grieving mother clutching at her dead son. John’s mouth is open as if he is crying out in anguish. Maybe he is begging for some morsel of comfort. It is as if he is asking for help to endure what is before him, as he is aware of his task ahead, that of consoling Mary. The three figures are in a tight group in the foreground behind which is an infinite horizon. The sky is a steely grey-blue which gives a feeling of cold and accentuates the pervading anguish of the setting. This is indeed a very sad and moving painting. Once again I apologise to all of you who do not like the sight of blood as today’s offering is not for the squeamish ! My Daily Art Display painting for today is a diptych consisting of two oil on wood panel paintings, hinged together. The left panel painting is entitled Judgement of Cambyses and the right hand panel is entitled Flaying of Sisamnes. 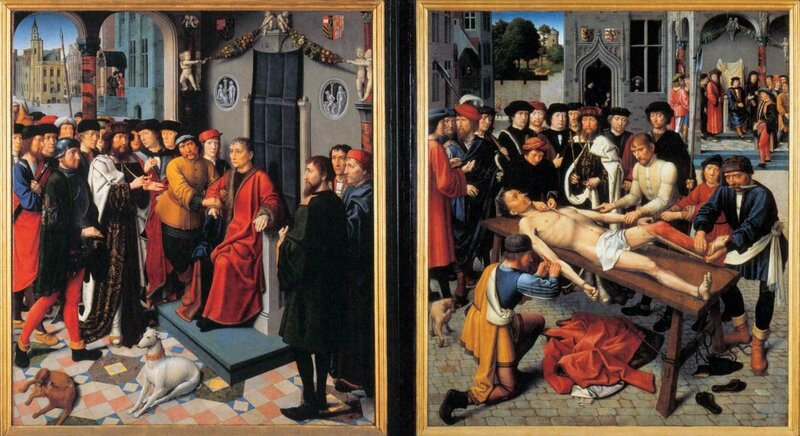 The diptych painted in 1498 by Gerard David, the Netherlandish painter can be seen at the Groeninge Museum in Bruges. The paintings are based on a story concerning the trial and execution of an unjust and corrupt judge, Sisamnes which occurred in the 6th BC. The great Greek historian Herodotus preserved for posterity the story of the harsh judgment of the Persian King Cambyses II, who reigned 529-522 B.C., against the corrupt judge Sisamnes. It is a story that for both its moral and its horror is not easily forgotten. The story is succinctly presented in the fifth book of Herodotus’s Histories. King Cambyses slit his throat and flayed off all his skin and he strung the chair, on which Sisamnes had used to sit to deliver his verdicts, with these thongs. Cambyses’s creativity did not stop there. To replace Judge Sisamnes whom he had killed and flayed, Cambyses appointed Sisamnes’s son, Otanes, as the new judge. Cambyses warned Otanes to bear in mind the source of the leather of the bench upon which he would sit to hear evidence, deliberate, and deliver his decisions. Without doubt, King Cambyses’s warning buttressed by the reupholstered seat left a lingering impression on his new judge. 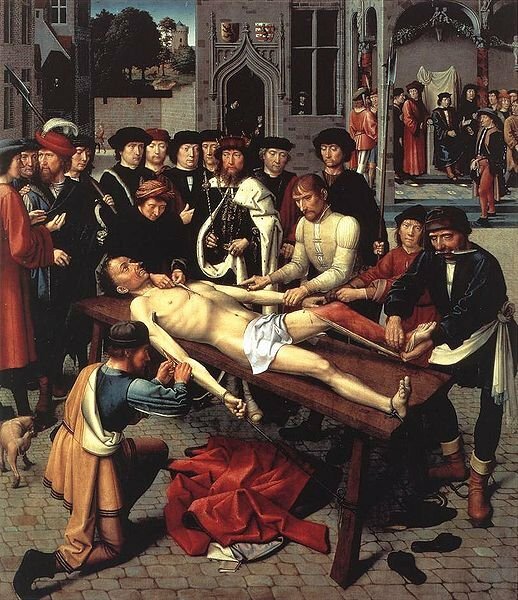 In 1498, Gerard David was commissioned by the aldermen of the town of Bruges to paint two panels depicting this ancient tale and the finished work was to hang in the chambers of the aldermen in the town hall. This was then a warning to the local magistrates, who would see the painting every day, that the town expected them to uphold their duty to render justice free of the corruption of outside financial interests. So that this 6th century BC story had any relevance to 15th century society, David used the technique known as “actualisation”, in which his painting was representative of that period by having the characters dressed in 15th century Flemish clothing. As was the case in yesterday’s painting, I would like you to focus on the details of the painting and by so doing, understand how David’s attempts to tell the story without the use of words. Look under the arch of the loggia. There we see Sisamnes’s crime taking place – that of a litigant or his servant handing over a purse of money to him as a payment for a bribe and this was the basis of the crime. Through the left hand arch of the loggia we can see David’s depiction of the Burgher’s Lodge in Bruges. Above the judge’s bench where Sisamnes sits one can see the crests of Phillip the Handsome and his wife Joanna of Castille. The bearded central character in the group who stand before Sisamnes is Cambyses, the accuser. Look how he seems to be counting on his fingers. This could well be him counting off the acts of Sisamnes’s bribery on his fingers as he angrily regales him with the accusations. One can see the concern on Sisamnes’s face as he realises his fate has been sealed. One thing David had to achieve with this painting was to conjure up a hate for Sisamnes and he did this by giving him the likeness of Pieter Lanchals, a conspirator who betrayed the City of Bruges to Maximillian I of Austria in his dispute with the Council of Bruges. The group of people, some of which were portraits of the then Bruges aldermen, represented the fact that the whole town was witnessing Cambyses’s accusation. The man, wearing the red cap, on the left of the seated Sisamnes is the young Phillip the Handsome, the ruler of Burgundy and the Burgundian Netherlands. The lozenge shaped medallions on either side of the judge’s bench illustrate scenes from Ovid’s Metamorphoses. On the left are Hercules and Delaneira, the wife he betrayed, and who then gave him a robe to wear which was soaked in the blood of the Centaur, which caused the flesh of Hercules to fall from his body. The crime perpetrated by Sisamnes was a betrayal of justice – a betrayal of the people of Bruges and the outcome of his punishment was going to be similar to that which happened to Hercules. The medallion on the right shows the god Apollo and the satyr Marsyas, who in the contest between them, the terms stated that the winner could treat the defeated party any way he wanted. Since the contest was judged by the Muses, Marsyas naturally lost and was flayed alive in a cave near Celaenae for his challenge of a god. Marsyas was the symbol of hypocrisy. David’s addition of this medallion was presumably a reminder of that salutary tale and that justice, which Sisamnes dabbled with, was a gift of the Gods, a gift to the public and his acceptance of a bribe to change the course of justice was a sin against his people as justice did not belong to him, it belonged to the people. 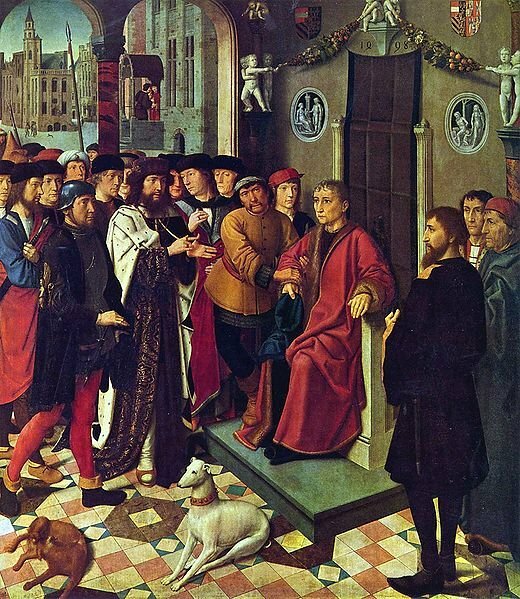 The right hand panel of the diptych illustrates the fate of Sisamnes after being convicted of bribery. The punishment was brutal, and yet not uncommon in the fifteenth century, that of flaying. David’s portrayal of the flaying is graphic and shocking. We see Sisamnes lying naked on a table, his judicial red robes cast aside on the ground below. One can quite clearly see the grimace of excruciating pain on Sisamnes’s contorted face as the four flayers busy themselves methodically with the gruesome task at hand. The skin of the body is carefully removed as it will be turned into leather strips to be used as upholstery for the judge’s chair. Those words were also meant to act as a deterrent to all future magistrates of Bruges, who may foolishly consider repeating the sins of Sisamnes. The paintings reminded them in a most abhorent way that they needed to be mindful that any betrayal of the trust given to them would be severely dealt with. These two paintings, although gruesome, are rich in colour and detail and worthy of a place in My Daily Art Display. After yesterday’s rather sad and depressing painting I thought I would try and raise my spirits (and yours) with a picture which has uplifted the spirits of many who have seen it at the Frick Collection in New York. 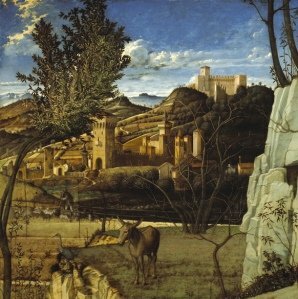 It is Giovanni Bellini’s composition which used to be entitled Saint Francis in Ecstasy, but is now known as Saint Francis in the Desert. It is an extremely beautiful and powerful work of art which the Venetian master painted in 1480. It is a painting full of detail some of which is easily missed if one only gives it a cursory glance. The gallery itself has no doubt about its worth, stating that it is “the finest work in The Frick Collection and the greatest Renaissance painting in America and also one of the best preserved”. True praise indeed ! This is my type of painting. It is an oil on tempera on poplar panel painting. I love and I am often mesmerised by paintings which are highly detailed and in which the artist has painstakingly spent a good deal of time in presenting us with such an extraordinary level of detail. For me, there is no comparison to be had between a watercolour picture, as beautiful as it may be, in which details are merged and lost in a haze of colour, and an oil painting with its precise detail of every bit of minutiae within the work of art. There is a spiritual force to this painting, which I am sure moves even those non-believers. The story behind, and the setting for the painting is Saint Francis of Assisi, whilst in retreat, praying and fasting in preparation for Michelmas, received the stigmata, the wounds of Christ’s Crucifixion. This is said to have taken place in 1224 during a retreat at a hut, which was given to Saint Francis by Count Orlando of Chiusi as a place to meditate. It was situated high in the Tuscan hills, above the Apennine forest on Mount Alverna. Saint Francis, slightly right of centre in the painting, stands, leaning back slightly with his arm outstretched. He is looking transfixed heavenwards at the transcendental light, which emanates from the upper left of the picture. 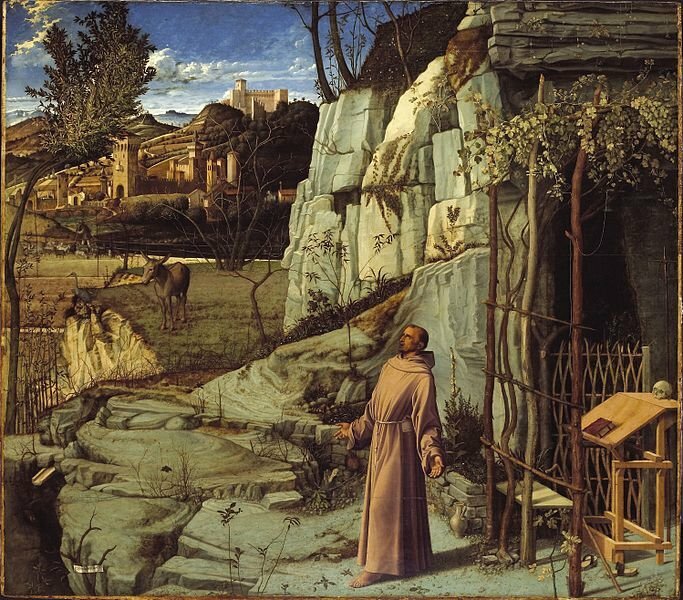 If one looks closely at the figure of St Francis one can just make out the mark of stigmata on the palms of his hands. 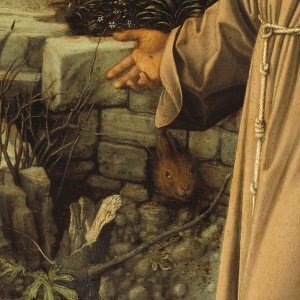 This miraculous happening is shown as a shadow both illuminates the rocky entrance of St Francis’s dwelling and casts a dark shadow behind the saint and onto the espaliered limbs of the small trees, which act as a screen to the entrance of his dwelling. Look also at the laurel tree at the left of the picture. The laurel, with the fact that its leaves never wilt and preserves its green foliage, makes it symbolic of eternity. In this painting, see how the light illuminates the leaves. It is almost as if it is under a spotlight. Look how it trembles and bends as if being buffeted by strong gusts of wind as it leans into the picture. Let us look in more detail at the picture. Cast your eyes at the bottom left corner of the painting. One can just see, caught in the branches of a bush, a scrap of paper, on which is written the artist’s signature “IOANNES BELLINUS”. 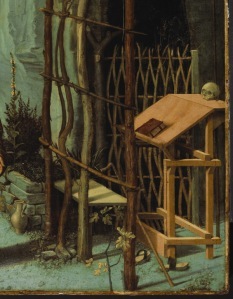 Behind Saint Francis, on the small reading table is a bible and skull, the latter represents death and the transitory nature of life on earth. One can also see a length of cord on the espalier which could have been used as a “bell-pull” by visitors to the retreat. In the field one sees a solitary donkey, standing motionless, and a crane. Further back, below the cliffs and on the outskirts of the city, we see a herdsman with his animals, unaffected by this transcendental happening. Put all these things together and it is no wonder that people tell you that this painting has such magical appeal and once seen will remain in your memory for a long time. If you live in or are lucky enough to visit New York, pay a visit to The Frick Collection which is much smaller than its nearby neighbour the Metropolitan Museum of Art but offers you a wide range of masterpieces of the art world. Go to today’s painting, stand in front of it, look at all the wonderful detail and absorb the beauty of this breathtaking work of art. On December 31st the painting of the day was The Beggar known as the Club-foot by Ribera. It was a painting of a smiling boy, despite his physical disability, on his way to town to beg for food. Today’s painting is also of a beggar but in this work of art we are not treated to the sight of a happy child. My Daily Art Display offering today is The Beggar Boy by the Spanish Baroque Bartholomé Esteban Murillo, the Spanish Baroque painter who was born in Seville in 1616. Murillo came from a very large family, the youngest of fourteen children. His father was both a barber and surgeon. His parents died when he was young and he went to live with a distant relative and artist, Juan del Castillo who started Murillo’s artistic education. He stayed with Castillo until 1639 when his mentor had to move to Cadiz. Now Murillo, aged twenty two, had to fend for himself and scraped a living by selling some of his paintings. In 1643 he travelled to Madrid where he met Velazquez who was also from Seville and had now become a master of his craft. He took pity on Murillo and let him lodge in his house. He stayed in Madrid for two years before returning to Seville. In 1648, at the age of thirty one, Murillo married a wealthy lady of rank, Doña Beatriz de Cabrera y Sotomayor. Murillo died as he lived, a humble, pious and brave man, in 1682, leaving a son and daughter, his wife having died before him. Murillo has always been one of the most popular painters. His works show great technical attainment and a strong feeling for ordinary nature and for truthful or sentimental expression without lofty beauty. He was the last pre-eminent painter of Seville, a prolific worker hardly leaving his painting-room save for his devotions in church. His works of art achieved high prices and made him a great fortune. Probably best known for his religious works but produced a large number of paintings depicting contemporary people, mainly women and children. His realist style when painting those struggling with poverty, such as beggars, street urchins and flower girls gives one a good insight of life in those days for those who were impoverished. Today’s painting The Beggar Boy, painted circa 1650 and which now hangs in the Louvre, shows a bare-footed young boy sitting, lit up by sunlight streaming in through an opening in the thick walls of the building. He, dressed in ragged clothes and is slumped on the stone floor of the darkened room with a sad downcast expression. His feet are bare and the soles are blackened and bloodied. 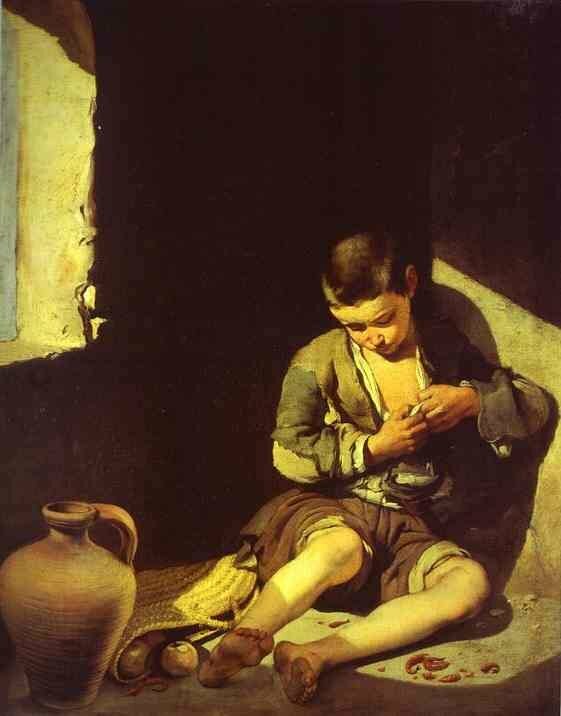 There is no hint of happiness in his expression, which is in complete contrast to Ribera’s Boy with Club-Foot. We can only imagine what is going through his mind. Desperation and sadness with his lot in life must be uppermost in his thoughts. The feeling of dejection and hopelessness pervades his being and the future for him looks bleak indeed.